A note about our parts. We’ve been hesitant to sell trailer parts on the internet. Many items are common parts; tongue jacks, cheap tires, etc. are available everywhere. Shipping adds costs that you don’t need when you can stop by an auto parts store, Wal Mart or NAPA. But we’ve been inundated by customers that want quality products that are difficult to find. The parts we sell are first line quality that we use. Our tires have the highest load rating, we offer only the best load guides available, etc. Angled load guides come standard with 5 1/4" long mounting bolts, washers & lock nuts. enough to help get your boat on straight. For a better installation mount another set further forward. Two load guides in the back are sometimes all you need. 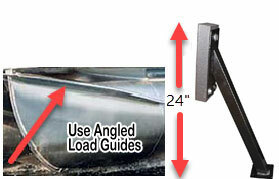 U-Bolts are included with the load guides above. 2" x 5" for 3" or 4" cross members $1.95 ea. Tongue jacks are almost a commodity, you can buy them anywhere. The cheapest 500 lb. jack will lift most boats off the hitch. The thing that destroys tongue jacks is backing into them with the single wheel sunk into the ground. The dual wheel jack is stronger, it rolls easier and it’s easier to crank. But the big benefit is that the dual wheel usually prevents it from sinking into ground. Swings up out of the way for travel.